For nearly a century, the world practically stood still for residential lighting, as we mostly just lit our homes with incandescent light bulbs. In the last few years, however, a rapid change has taken place, and there are things you should know about lighting your home! There are different SHAPES of light bulbs for different purposes. 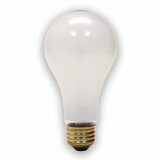 You'll use an A19 bulb in your standard lamp, for instance; globe bulbs around a bathroom vanity; candelabra bulbs in a chandelier; reflector bulbs in recessed lighting; etc. You'll choose those by application. This is the original light bulb technology developed by several inventors around the time of Thomas Edison, who in fact just developed the first commercially viable lightbulb. There are also bulbs called "Edison Bulbs," which give you an awesome retro look for certain design goals. 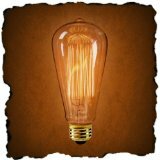 You can learn more about Edison bulbs here or buy them here at a great price. But overall, with incandescents we're just talking about a filament based bulb. These are really inefficient (expensive to run -- energy wasters), but of course we've gotten used to them, so there's a lot of resistance to changing to other bulbs ... partly because the bulbs themselves are dirt cheap, but despite the fact that other bulbs can save us a lot of money over time. B) Incandescent bulbs aren't known to cause long-term health problems, and there are some concerns about the impact of CFLs overall and possibly LEDs on our eyes. Rough Service Bulbs -- these look like and work like your average A19 incandescent light bulb, but they can still be made and sold in the States. They are designed to withstand vibration, so there's more support for the filament. This "special application" saved it from the light bulb ban. They often cost about 2-4 times as much as older light bulbs, but they last twice as long as well. However ... if you want to maintain the same amount of light in an area when replacing an older bulb, go UP one wattage level. To replace a 60-watt bulb, for instance, go with a 75-watt rough service bulb. This is because these are designed for 130V systems but will run on 120V in your home. This lowers light output and energy usage and makes it similar to a 60-watt bulb in effect. These are also incandescent bulbs, but because they're more efficient, they weren't banned. (Yet.) You see, the legislation didn't outlaw incandescent bulbs, per se, but said that they had to be more efficient. Halogen bulbs address the immediate demands of this legislation, although the standards will increase over time and may eventually put these bulbs out of business too. In the meantime, this means that you can still use incandescent bulbs if you want to -- just buy halogen. 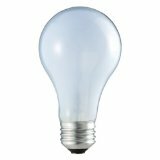 (Buy GE halogens on Amazon | Buy Philips halogens on Amazon) You'll see these in a lot of places that sell light bulbs -- even your big stores like Target or Walmart. The thing to know is that these usually burn a little bit whiter than other incandescents, and they have about the same life span. So even though they'll save you money on energy, this is about offset by the slightly more expensive bulb. Bottom line is that any incandescent bulb option will cost you about the same amount over time, but you still have the option despite legislation if you really like incandescent bulbs. We all know these bulbs by now -- usually with a spiral shape, but sometimes encased in a bulb envelope to look more like a traditional A19 bulb, these were the big replacement bulb for saving everyone money, and they seemed ideal ... until people started to realize that they contained mercury, which means a toxic clean-up effort if one breaks in your home. A lot of people also didn't like the glaring white from these bulbs, or the fact that most of them can't dim, or the fact that they take a minute or so to come up to full brightness. On the other hand, they use way less energy than incandescent bulbs (a 13-watt CFL bulb replaces a 60-watt incandescent), and they've gotten dirt cheap -- around $1 to $2 per bulb as of this writing. 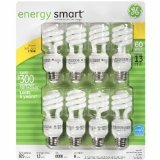 (Buy on Amazon) At 3 hours of use per day and 15 cents / kWh (with energy delivery costs, this is a fair US average), you're looking at nearly $8/year in savings for every bulb you replace. And CFLs have the potential to last up to 10 times as long as the older bulbs. That, however, is a potential, and you're likely to only see that happen if you use them in settings where they're rarely turned on and off. If you keep certain lights on in your home for hours at a time (from dusk till sleep, for instance), then they could last a long time. But there's more to the story with CFL bulbs. First, the mercury issue is also real -- if you break a bulb, you have to take precautions in how you clean up as shown on the EPA website. BUT ... in terms of environmental impact, incandescents run from coal produced power (about 44% of the power in the US) will put more mercury into the environment than CFL bulbs! Still, CFLs should definitely be recycled by stores that recycle them -- don't just throw them in the trash! There's also a problem of "dirty energy" within your actual house, which has been implicated in causing health problems, and CFLs appear to be the big trouble makers in terms of light bulbs when it comes to dirty energy. More on that below. Unabashedly, my favorite light bulbs are LEDs. I've been waiting for them to become affordable since I discovered what bad news CFLs were and confirmed with an expert that LEDs would not cause dirty energy problem. LEDs have no mercury in them, and they dim nicely as long as you're on a compatible dimmer. (Older dimmers can have problems with them; but dimmers are pretty easily switched out if you like.) If you need a dimming bulb, though, make sure the package tells you that the bulb will dim! They also provide "K" temperatures from a warm white 2700K up to a daylight white, 5000K+. (Most people normally don't want those in most of their homes, but you might want them in utility locations like a laundry room or garage.) Like halogens, they can run a little whiter than your traditional incandescent, even when purchased at 2700K; but for me, they're a close match. Importantly, I love knowing that, when the lights go on, I hardly pay a dime to run them. LEDs also offer another advantage: some of them are programmable, and this takes us into the realm of "Smart Bulbs" and, more broadly, "Smart Homes." I'll talk about these in a later article, but in short, you can get LEDs that produce any color you want; that can turn on and off based on your location or a timer; they can dim or brighten to help you fall asleep and wake up (this is the trick that can help the body somewhat, by mimicking the sun and stimulating the right sleep and waking hormones). They can also do much more, to be discussed another time. Be warned, however: smart bulbs connected to your WiFi can cause security problems and give hackers access to your bulbs or, worse still, to everything connected to your router. I'll write more about this when I get around to writing specifically on smart bulbs. This is a controversial topic, and I don't understand it well enough to give guidance on it one way or another. However, some electrical experts claim that electrical fields themselves are not the problem when interacting with our bodies' own electrical fields. Instead, it is the interaction of waves within these fields that determines if they're a problem or not. This is why we get mixed results in different studies about whether cell phones or other products are dangerous for us. This makes sense from my own layman studies of waves -- a wave does nothing on its own, but its interactions with other waves causes interference patterns, which create or destroy reality as we know it. This is a complex topic and a simple way of saying it, but I believe it's valid and there are some pretty lofty thinkers who believe this. Problematic interference problems from electrical devices, according to some, are called "dirty energy." And this energy can mess with your body's own fields and cause a wide range of health problems. 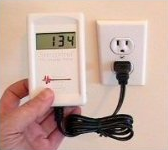 Of course there is a solution as well: according to one electrical expert, this device (which he developed) can measure dirty energy within the home simply by plugging it into an outlet. And using that as your guide, these filters -- plugged into walls throughout your home -- can bring the dirty energy down to reasonable levels. This can get expensive, given that you could need 15-20 filters for an average home. But if you're interested in doing this but don't have that much to invest, you can prioritize and start with areas where you spend a lot of time, especially near all the beds in your home. Again, this concept is controversial, but here's what I can tell you: first, the meter will read numbers from your electrical sockets, and these numbers will go down when you add the filters to sockets on the same line. So the filters definitely do something -- I just can't guarantee that they provide a health benefit. Second, CFL bulbs seem to drive up dirty energy levels like crazy. Ideally the numbers read below 30, or at worst 50. Most homes will start in the hundreds until filters are in place. But when we measured rooms where CFLs were installed, our dirty energy numbers rocketed by several hundred. When we replaced those lights with incandescent or LED bulbs, there was no change at all. So besides the mercury issue in CFLs, this is my main dislike for them. Finally, you can dig further into research on this here. I hope this helps you to understand light bulbs for your home and the curious topic of dirty energy.